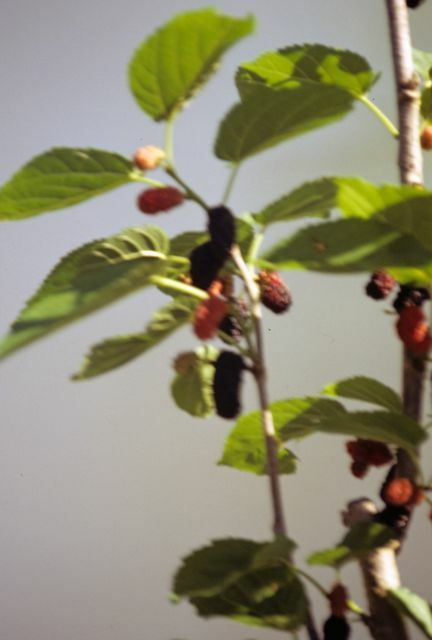 A very rapid growing deciduous small tree, mulberry fruits very early in the spring and is an excellent wildlife food source at a time of year when there is little ripe fruit available. There are three species: Black, White, and the native Red mulberry. Selected cultivars have the best fruiting characteristics, with large black berries up to 2" long that taste like seedless blackberries! Mulberries are an important source of food for deer and game, and migrating birds such as Robins, Waxwings, and thrushes. Very easy to grow. Begins to bear fruit within 2 years.